Not only are 2017’s high-profile sexual misconduct scandals completely gross, they’re also ruining your office holiday party. 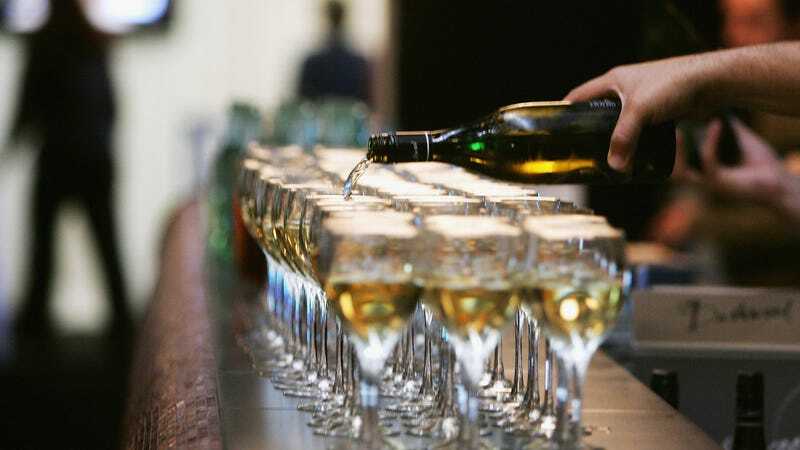 The Associated Press reports the results of a survey conducted by Chicago consulting firm Challenger, Gray & Christmas, Inc. that finds a 13 percent drop in the number of offices that plan to serve alcohol at this year’s holiday parties. It’s considered a response to the recent allegations that have exposed the likes of Harvey Weinstein, Matt Lauer, and Kevin Spacey. In 2016, 62 percent of offices said they’d serve booze at December festivities; this year, a measly 49 percent. The AP reports that as a wave of high-profile men in business, media, and tech stand accused of inappropriate sexual behavior, offices are fearful of what the combination of booze, mistletoe, and coworkers could yield. One such company is Vox Media, which fired its editorial director, Lockhart Steele, last month after he was accused of sexually harassing a former Vox employee. Huffington Post reports that Vox will scrap its customary open bar this year in favor of drink tickets and more substantial passed appetizers. Uh, so we all get a cup of La Croix at our desks? Sounds like any other Thursday.